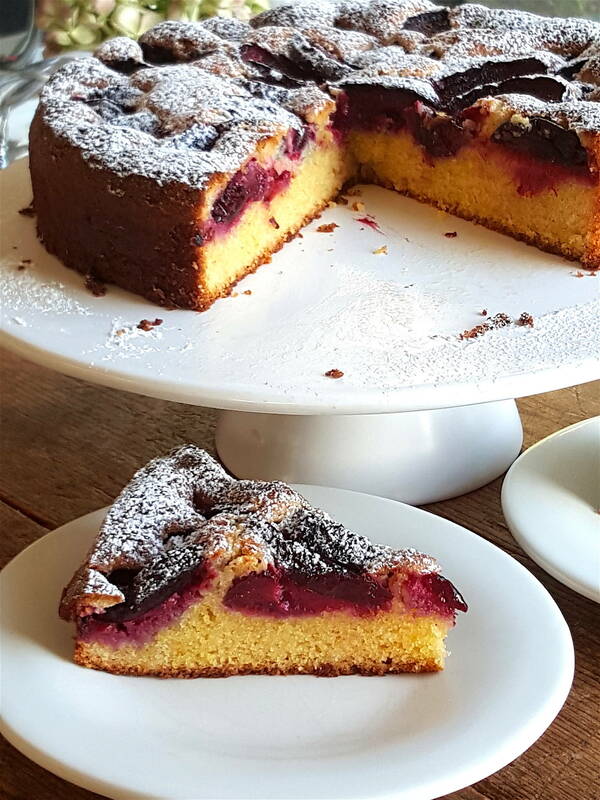 Plum & Almond Cake for breakfast? If you are lucky enough to leftovers! Plums and almonds are sensational together. 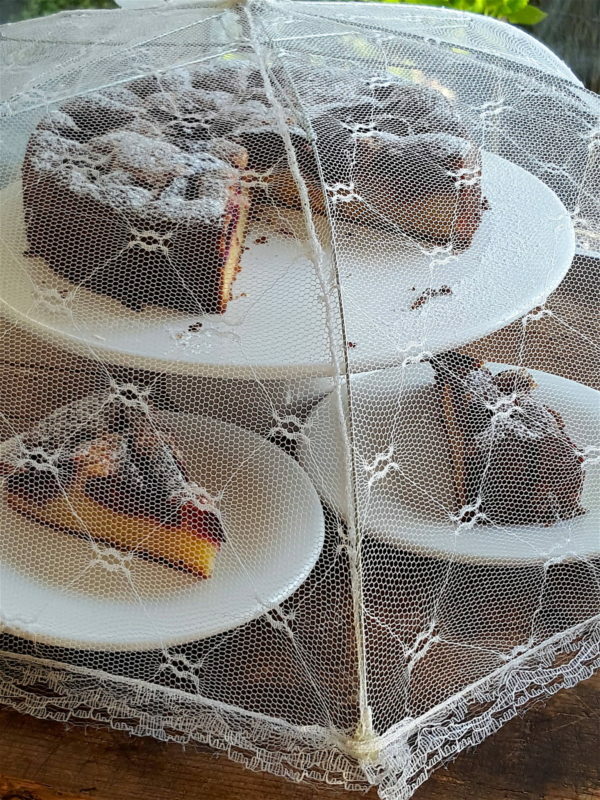 The cake is surprisingly light and will keep several days. 1 Preheat oven to 180°C (regular bake/350°F). Brush a 22-23cm (9”) cake tin (cake pan) with butter, put a disc of baking (parchment) paper in the bottom then shake a little flour around the tin (it will stick to the buttered sides of the tin). Tap out excess flour. Measure milk so that it is at room temperature when called for. 2 Put butter in a bowl and beat with an electric beater until creamy and loose, then beat in caster sugar a tablespoon at a time and continue beating until fluffy and lighter in colour. (Read all the tips HERE). Beat eggs together with a fork, then add them gradually to the creamed butter and sugar, adding 2 tablespoons of the measured flour halfway through beating to help stabilize the mixture. 3 Sift over remaining flour and fold in using a large metal spoon. Mix in ground almonds, lemon zest and milk. Spoon cake batter into prepared tin, smoothing the top with a knife. 4 Halve the plums, remove stones and cut each plum half into 3-4 pieces. 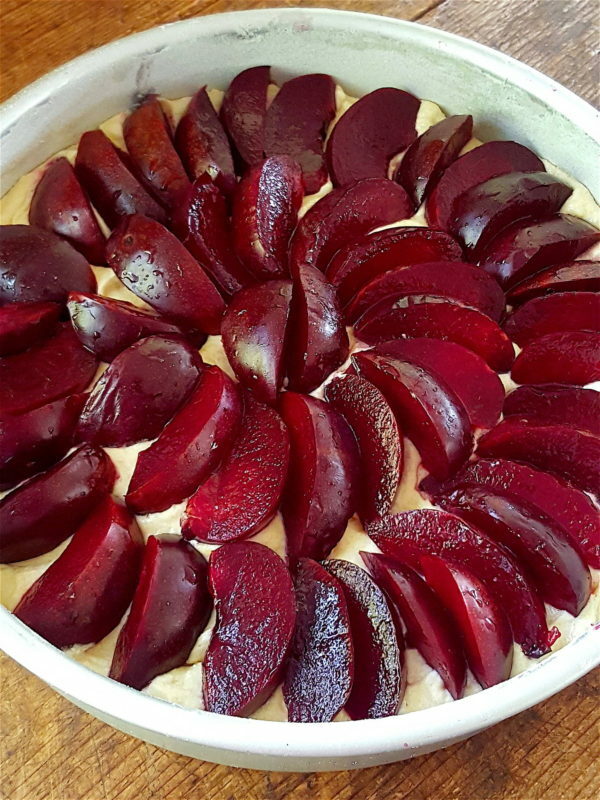 Place plums on top of cake batter – they don’t need to be arranged as they will sink into the batter during cooking (although I often plop them on in a spiral). Bake cake for 45-55 minutes, or until well risen and golden. The cake should spring back when touched lightly in the centre with the finger and be shrinking slightly from the sides of the tin. 5 Remove cake from oven and let it cool for 15 minutes in the tin. Loosen from the sides of the tin with a flat-bladed knife. Turn cake out of tin by covering it with a large plate, then turning cake and plate over so cake falls onto plate. Lift tin off. Peel baking paper off bottom of cake if still attached, then cover cake with a cooling rack, flip over and lift off the plate. Leave to cool. Dust with icing sugar and transfer to a serving plate. Read the notes on How to make a fabulous butter sponge cake – all the tips! Because understanding the process can make the difference between success ­ a rich, buttery open-textured cake and a sunken heavy greasy cake. Plums fall into three categories: those that are great for eating fresh, those which excel in jams, preserves, or as bottled fruit, and those that serve both purposes well. The plum season runs from December through to March and there are plenty of varieties to choose from. Generally, the deeper red skinned and fleshed varieties such as black doris (available late season) are better in jams, jellies and preserves, but many of these plums also make good eating. Some paler fleshed plums are good in baking, but taste them first, and adjust sugar content – tart and sharp plums need a lot more sugar to make them palatable than sweeter-eating varieties. A food umbrella is handy to protect cakes while they cool. Foraging pays off ... make a yummy pesto from nasturtium leaves. Roasting buttercup pumpkin intensifies the sweetness – crank up the oven!